London bids farewell to the Games at the closing ceremony of the 2012 Paralympics. See all the pictures. Cape Town - South Africa's medal-winning Paralympics will be rolling in extra Rands - while Sascoc will be scrambling for the cash - following Minister of Sport Fikile Mbalula's decision to upgrade their monetary incentives to equal those of their Olympics counterparts. When Sascoc originally announced the incentives in July this year, they offered Olympic athletes R400 000 for a gold medal, R200 000 for silver and R80 000 for winning a bronze medal. Paralympic athletes were offered R100 000 for gold, R75 000 for silver, and R40 000 for bronze due to there being far fewer competitors/opposition (4 200 v 10 500), yet far more events at the Paralympics (503 v 302). In fact, when combined, there are more athletics events (170) and swimming events (148) at the Paralympics than at the entire Olympics. The SA Paralympic team took home eight gold medals, 12 silver and nine bronze, which, under the original incentive scheme, would've cost Sascoc a total of R2.06 million. However, thanks to Mbalula's generosity, those SA Paralympics lucky enough to secure a podium finish in London, will now share in R6.32 million - an increase of R4.26 million. 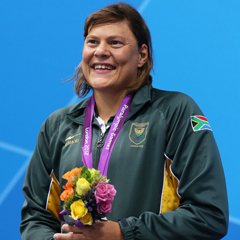 Natalie du Toit was the biggest beneficiary, as her three golds and one silver medal - which would've seen her pocket R375 000 under the "old" scheme - will now see her smiling all the way to the bank to the tune of R1.4 million. The SA Olympic team took home three golds, two silvers and one bronze, which set Sascoc back a grand total of R1.68 million. HAVE YOUR SAY: Do South Africa's Olympians and Paralympians deserve equal pay for winning a medal, irrespective of the number of opponents in each event? Send your thoughts to Sport24.